By the end of her first semester at the university, Wood had already found her voice on campus. For those who knew Sarah Wood well, when their paths crossed each day, they would be rewarded with a glimpse into a sketchbook filled with Wood’s unique drawings, a love for fun that infected every room she entered, a never failing will to speak her mind and stand up for her strong rooted beliefs. Wood, a freshman student, passed away on Dec. 18, at 19 years of age. Wood graduated in 2016 from Indian River High School. During high school, Wood was the president of the Technology Student Association and a member of the school’s soccer team, a sport she played avidly since the age of six. According to one of Wood’s closest friends Chase Robinson, Wood was the most passionate person she had ever known. “She was very passionate about everything that she loved, whether it be art, being a feminist or standing up for people that she didn’t even know,” Robinson, a freshman at the university, said. Robinson also holds a high regard for Wood’s art, which she described as intricate and different from anything she’d ever seen before. For those closest to Wood, they knew that art was just one of the many things that Wood loved. A devotion to academics also was evident, with Wood making the Dean’s List for her first semester at the university. Wood’s “authentic voice” shined bright in one of Professor Kathleen Turkel’s introductory level Women’s & Gender Studies classes. One of 60-some students in the class, Wood still managed to make herself known. One of Davis’ fondest memories of Wood occurred in the middle of a class debate about the play Antigone. One of Wood’s floormates, freshman Jacquelyn Attardi, recalled Wood’s uplifting presence wherever she happened to be. “Whenever I saw her, she always had a smile on her face even if she was having a bad day. She brightened up your day a whole lot whenever you saw her, her presence was uplifting,” Attardi said. Attardi echoed many of the same sentiments from Wood’s other friends regarding her art, remembering fondly how much her love for life and for art fuelled what Attardi called an amazing talent. Freshman Max Remmler found comfort in both Wood’s art and her company. Wood is survived by her parents, Lawrence and Margaret (Gebhardt) Wood, along with four siblings: Matthew, Katy, Timothy and her twin brother, Sam. 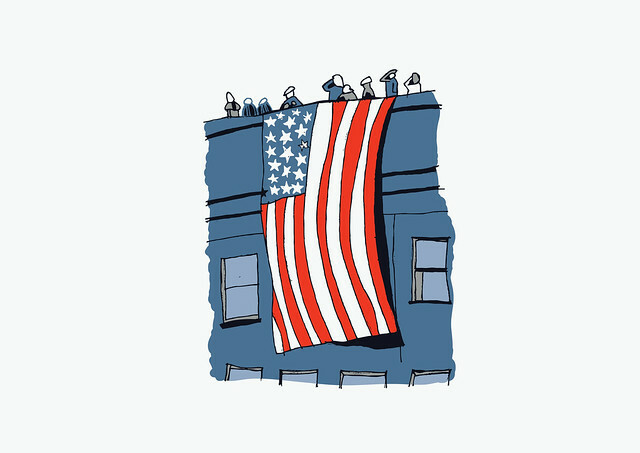 No matter where one was at 8:46 a.m. on Sept. 11, 2001, there is a story.